We already have an article on how to check a car battery using a single tool, a voltmeter. 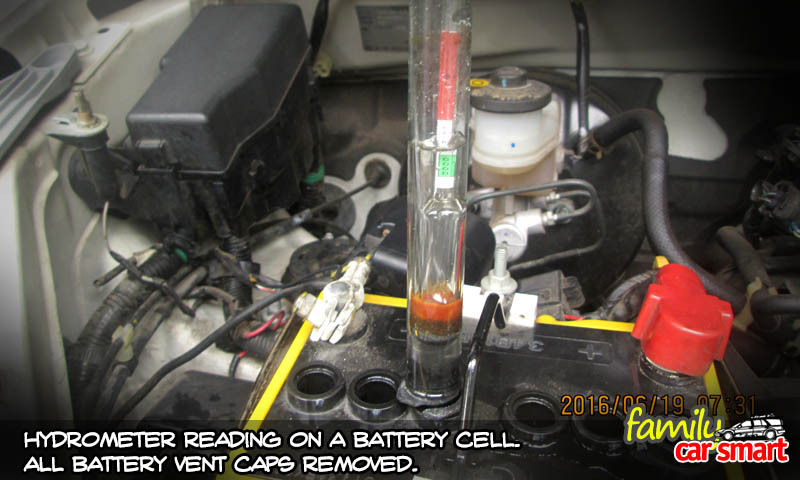 There is alto another way to check a car battery condition with only one tool, a hydrometer. A hydrometer is simple device that tells the specific weight (density) of fluid. It can give readings for about any fluid, not specific for acid in a car battery. However, hydrometers are available for different fluid and ranges. What we are discussing here are hydrometers for vehicle batteries. A hydrometer works using the Archimedes law. After fluid is drawn into the transparent barrel, a float in the barrel will displace the fluid that entered the barrel. The float will be immersed in the fluid. Depending on the fluid specific weight, some part of the float will stay above the fluid surface. The specific weight of the fluid will determine how much part of the float stays above the fluid surface. Fluid with a high specific weight will lift more of the float above the fluid surface. On needle type hydrometer, the float will move the needle on the calibrated dial to show the fluid specific weight. On the tube float type, the scale on the float will show the fluid specific weight. Many hydrometers are even marked with colors to make it very easy to know a battery condition (green or blue means OK, white means fair, and red requires attention). For a vehicle battery, the reading should be between 1.25 and 1.29 at 20 degree C.
Here is a reference of battery charge status according to its electrolyte (acid) specific weight. (picture from rpc.com.au). This is pretty much quite reliable to determine whether the battery holds charge and can still hold charge when charged by the car’s engine alternator or an external charger (for recommendation on external charger, see the CTEK MXS 5.0 review here, coming soon). 1. Prepare your hydrometer. If any rubber suction bulb or nozzle must be installed, make sure they are tight and will not leak. Wearing thick gloves are recommended. Prepare a piece of paper to take note of each cell condition. 2. Remove out battery cell vent caps. On some batteries, these may be hidden under another cover. There are six cells in a 12 V battery, so there are six vent caps to remove. 3. Insert the hydrometer into the battery cell. Hold the hydrometer firmly and press the rubber suction bulb to pull fluid (electrolyte) into the hydrometer. 4. Wait for a few seconds. On tube float hydrometer, make sure the float is not stuck to the outer barrel. 5. Read the scale at eye level. Write down the result for each corresponding cell on the note paper. 6. Lift the hydrometer so its suction nozzle is above the fluid surface. Press the suction bulb to return the electrolyte into the battery. 7. Check every cell on the battery. Even one defective cell can make the battery useless, even though all other cells are in very good condition. Compare the results with the descriptions above and find the battery charge condition. 8. Flush the hydrometer using clean water as if checking the water weight, and keep it a safe place. 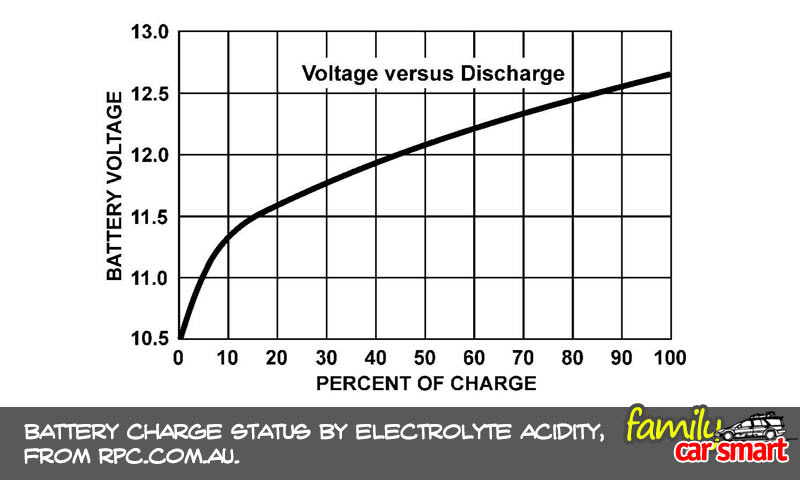 A low electrolyte (acid) specific weight means the fluid cannot sufficiently act in battery charging. However, this might not mean the battery should be disposed. In many cases, sulphatization has built up in the battery which shields the battery cells from charging appropriately. Charging the battery with an external device, such as the CTEK battery charger may help on this. Information on safety: Caution must be exercised when dealing with the battery acid. The acid is very strong and can eat cloth and burn hands. Wearing gloves is recommended. Prepare clean water nearby to wash any affected part or body. Give due attention to safety when making any modification /action. I assume no responsibility to any damage /injury /loss of warranty whatsoever due to any modification /action mentioned in any page of familycarsmart.com. Any person who makes the modification /practice the tip, trick, or takes any action described herein shall do so at the person’s own risk. For safety, consult the vehicle /equipment /device manual. Any necessary safety precautions must be taken. When necessary, consult the car manufacturer concerning warranty, safety, or any risk involved. I hope this article will be useful everyone. If you have any suggestion or comment, just fill the comment box below. Thank you for the article. This is a very useful tip for us car owners. Waiting for more quality tips for us car owners. Should we keep the hydrometer in the car? You’re welcome. Familycarsmart.com will always try to provide quality and useful tips and tricks for car owners. 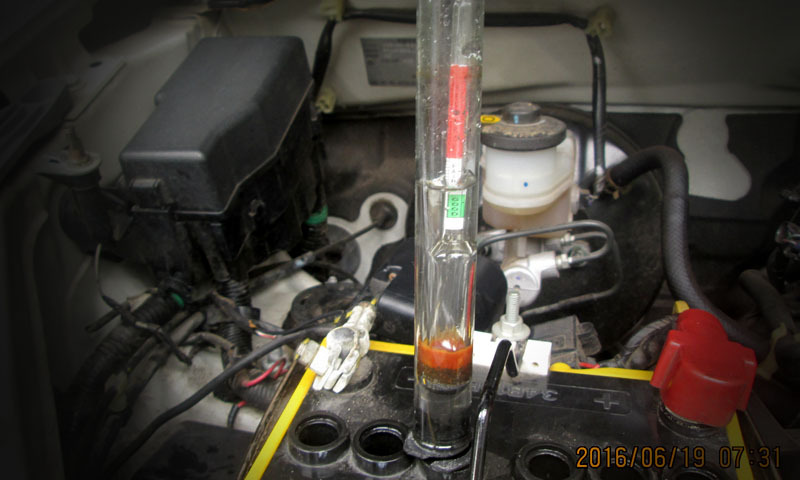 You don’t have to keep a hydrometer in a car. Just make sure to test the battery (its electrolyte /acid) condition every few weeks or so, and more often as the battery gets older. It may save us from one cold morning start failure.